taking photographs of this sculpture located in the new millenium park in chicago, being a public place, is forbidden unless you have the artist’s permission. see new (sub)urbanism: the copyrighting of public space. 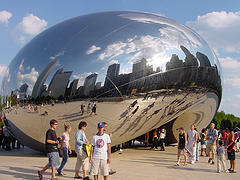 i’m happy to help violating this regulation by showing an unapproved photo of the so called “cloudgate” (taken by nes jumpman, free to use through a creative commons licence).